Price is per 16-inch strand of these beautiful beads - each tube measures 28mm x 25mm x 5mm, about 14 to the strand. Lapis Lazuli is gemstone straight out of fairy tales of the Arabian Nights: deepest blue with golden shining Pyrite inclusions which twinkle like little stars. Named after Lapis, the Latin word for stone, and the Arabian for blue. Thousands of years before Christ, Egyptian and Persian royalty wore lapis as a talisman to deter danger. In other cultures it was worshipped as a holy stone and thought to have magical power in oriental countries. Many believe the Biblical sapphire was actually lapis lazuli. Through the ages, lapis has been associated with power, wisdom, love, and a stimulant for psychic ability. And in the art world its famous for the ultramarine blue paint used by the Grand Old Masters, like on portraits of the Virgin Mary. While other compositions have long since paled, lapis has lost nothing of its brilliance. Lapis is still mined in the remote mountains of Afghanistan, the best stones being deep and intensive blue with finely distributed golden crystals. The twinkling inclusions are not gold but pyrite, caused by iron. The blue color comes from the sulfuric content of lazurite, and looks dull until polished. 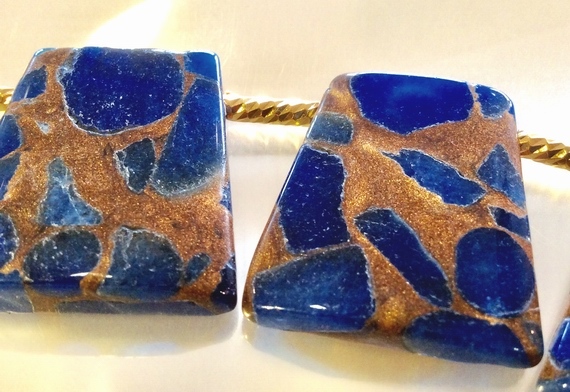 Lapis is a soft stone that should be treated gently while polishing. Unpolished, the dark blue looks dull with golden inclusions and whitish veins from marble. However, a Lapis which has dulled after being worn too often is easily polished, and jewelry is often surface sealed with wax or resin.